If you’re a lover of garlic, this dish is one that will impress family and friends. Tip: While the garlic is roasting, sautè the mushrooms and grate the Gruyere cheese. When the garlic is finished roasting, adjust the oven temperature and toast the baguette slices. In a small saucepot, on med-low heat add 1/2 a cup of olive oil and 2 heads of garlic, cut in half lengthwise (cut lengthwise through the middle), face down into the oil. Bring the temperature up nice and slow, so that the garlic infuses with the oil. Simmer for 20 minutes. You DO NOT want the oil to boil. After 20 minutes turn the heat off and allow the garlic to continue to steep in the oil. Using a pair of tongs, remove the garlic heads. Reserve 1/4 cup of the garlic oil. Peel most of the outer paper off the garlic bulb. Trim about 1/4-inch off the top off the garlic bulb. Do this for each of the six heads of garlic to expose the tops of the garlic cloves. Drizzle 1-2 teaspoons of olive oil over the exposed surface allowing the oil to seep down into the cloves. Season with Kosher salt, and pepper. Wrap the 6 exposed garlic bulbs in foil, place on a rimmed baking sheet pan, and bake for 40 minutes. After 40 minutes, begin checking the garlic. The garlic is done when a center clove is completely soft when pierced with a paring knife. Exact roasting time will vary depending on the size of your garlic. Remove from the oven and let cool. Squeeze out the roasted garlic into a bowl. Note: Even once soft, you have the option to continue roasting until deeply golden for a more caramelized flavor. Check the garlic every 10 minutes. Allow the garlic to cool then remove their skins. Roasted garlic can be refrigerated up to 2 weeks. Turn oven temperature to 375-degrees F.
Slice baguette bread at a 45-degree angle into 1/2 -inch thick slices. Arrange the bread in a single layer on a rimmed baking sheet. Brush the top surface of each slice of baguette bread lightly with the remaining garlic oil. Sprinkle with Kosher salt and freshly cracked black pepper to taste. Place into the oven on the center rack. Bake for 12-15 minutes, or until the bread is golden. Preheat a large sautèpan on medium, add unsalted butter and olive oil. Once melted, add sliced mushrooms fresh thyme, and minced garlic. Cook for about 5 minutes, stirring occasionally until mushrooms become lightly browned. Reduce the heat to low, sprinkle with Kosher salt and black pepper, stir through. Simmer for an additional 8 minutes. Turn heat off and set aside. In a large Dutch oven, on medium heat add the roasted garlic cloves along with 1/4 cup of the garlic oil. Mash the cloves into the oil. Add the all-purpose flour to that mixture, stirring with a wooden spoon, cook for 5-6 minutes until a dark roux is achieved. Change to a large whisk, add 1 cup of the unsalted chicken broth, whisk to incorporate. Repeat until all the chicken broth (or vegetable broth) has been used. Add the chopped fresh rosemary. Season with salt and pepper. Bring to a simmer and cook for 15 minutes. Turn the heat down to warm (if you don’t have that setting remove from the heat), cover. Add a tablespoon of grated Gruyere to each slice of baguette Place back into the oven just long enough to melt the cheese. Remove from the oven and top with sautèed mushrooms. Set 2 slices of the on top of the roasted garlic soup. This dish is one that you will be making again and again. Ladle the hot soup into a serving bowl. 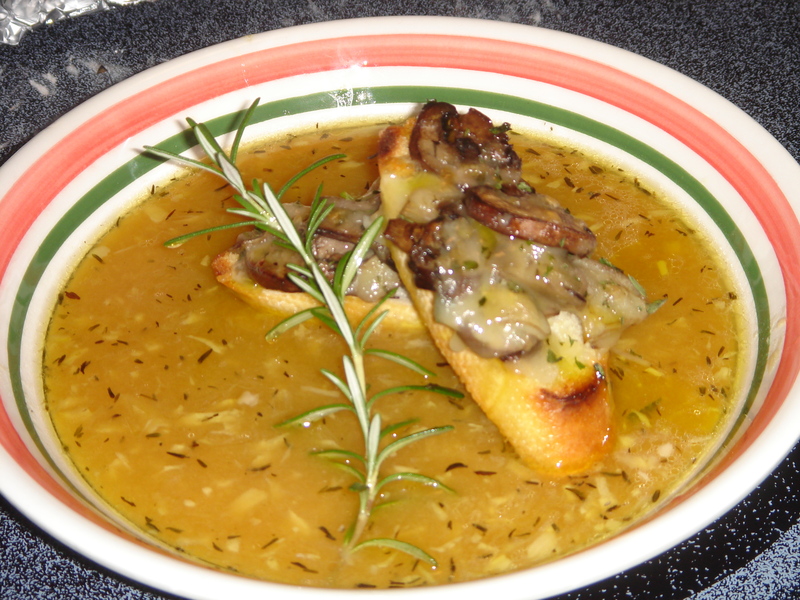 Set 2 slices of the Gruyere crostinis topped with the sautèed mushrooms on top of the roasted garlic soup. Garnish with a sprig of fresh rosemary.